The lead in the Volvo Ocean Race has now been taken over by Puma’s Mar Mostro. At 1900 UTC, Ken Read and his crew forced early leader Camper into second place, but there is no time for Puma to rest as the entire fleet is separated by only 2.90 nautical miles with Camper just 0.10nm behind them. 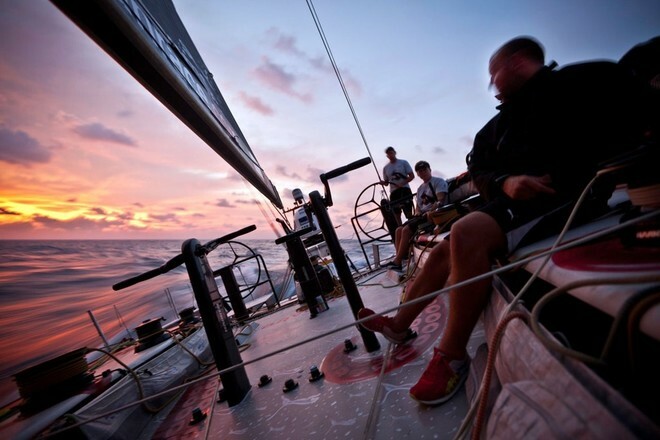 It is with universal relief that the six crews started Leg 3 Stage 2 from the Maldives to Sanya on Sunday. Everyone is happy to get back in the groove after the stop-start nature of past weeks, which was a necessary interruption to the racing action to avoid any possible interference by pirate activity. This 3,051nm leg will certainly throw in some curve balls in the shape of uncharted atolls, shallows, shipping and ocean debris, but for now, the fleet is enjoying a relatively straightforward first night at sea, on a port tack stretch across to Pulau We, an island on the northwest tip of Sumatra, Indonesia. As the crews settle into their watch systems, the navigation lights of those around them are clearly visible as the fleet races in warm air and flat water at around 12 knots. All six boats are currently south of the rhum line in order to avoid the effects of a wind shadow from the Sri Lankan coast. Mike Sanderson (NZL) has taken Sanya the furthest south, while Puma’s Mar Mostro is 4.21 nm to weather of the fleet. Team Telefónica (Iker Martínez/ESP) lost some valuable miles earlier on Sunday when a fitting on their code zero headsail failed, leaving the sail flogging and threatening to self-destruct. The crew has assessed the damage and is now hard at work on repairs.